It is with deep sorrow that we announce the passing of Deanna Olesiejuk (nee Docksteader). Predeceased by her husband of 53 years, Stanley, in 2013. She is survived by her children: Steven, Jean (Stewart) and Kathleen (Carrie); grandchildren: Lindsay (Rory) Marlon, Haley (Evan) Taylor, Kirstin and Tyson; six great grandchildren: Kya, Ashtyn, Leah, Cooper, Caden and Jason, as well as many nieces and nephews, all of whom loved their Aunty. Deanna was born in 1937 in Vancouver, BC, the only daughter and youngest of four children to Pete and Violet Docksteader. After graduating from Little Flower Academy, Deanna went on to study at UCB for a year before entering the RN program at St. Paul’s Hospital in Vancouver. This is when she met her soul mate, Stanley. Together they raised three children, first in Vancouver, then in Prince George, finally settling in Kelowna in 1979. Deanna was such a smart, caring nurse, as well as a loving mother. Family always came first, but her patients, a close second. She had a sharp mind for business, owning two small businesses as sole proprietor in Kelowna and one in partnership with Stan. Deanna operated the Apple at Gyro Beach for many summers, as well as imported Christmas decorations from all over the world and had a space in The Bay for many Christmas seasons. Later, Stan and Deanna sold cedar products at the Farmer’s Market and other venues around the Okanagan. Stan did all the manufacturing, but Deanna was the “brains” behind the business. 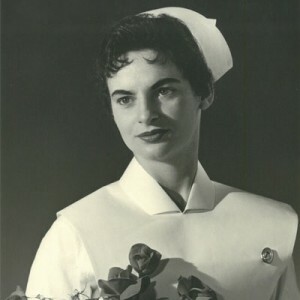 She was an RN for over 50 years, bringing a gentle touch and quiet words of wisdom to those under her care. As a wife, mother, grandmother and great grandmother, she had time for everyone and always made sure that everyone was made to feel that they were special, loved and never alone. For the past ten years of her career, she took care of Alzheimer patients and, ironically she was struck down by the same disease. Aware of what lay ahead, she fought hard and bravely and as the symptoms grew worse, she quietly left us. We will forever miss her. The service for OLESIEJUK, Deanna is scheduled for Saturday, April 14th at 2:00 pm. Below you will find the map for the service location and the contact information should you have any questions. Thank you to all who have been so loving an caring during this time. Truly an amazing family I am so proud to be a part of! Dave and o send our deepest condolences to you and your family. I know your Mom was much loved. Hugs to you and Carrie as you deal with your memories and grief. At this sad time i send my sincerest condolences to Steve, Jean and Kath and their families on the loss of their mom. Deanna was a great lady..